A built-in accelerometer captures distance and pace data when you're running on an indoor track or treadmill, with no need for a separate foot pod accessory. Once you're done running, it doubles as an activity tracker, counting your steps and calories throughout the day. It also reminds you to move after sitting for more than an hour. Forerunner 230 is compatible with GPS and GLONASS satellites to locate your position quickly and precisely whether you?re running deep in the woods or near tall buildings. Audio Prompts: Receive audio prompts from your connected smartphone, including laps and lap times. Larger Screen: Screen is 44 percent larger than Forerunner 220, but the same physical size. Improved Battery Life: Longer battery life than the 220; 16 hours in training mode and up to 5 weeks in watch mode6. GPS/GLONASS: Addition of GLONASS capability provides additional accuracy to the Forerunner lineup. Smart Notifications/Music Control: See incoming emails, text messages, call alerts, calendar reminders and more from your compatible smartphone. You may also control the music on your smartphone. 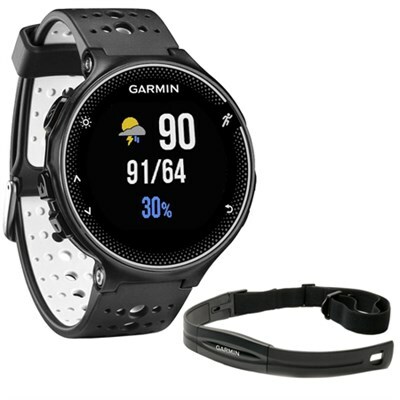 VO2 Max Estimates: Forerunner 230 running watch estimates VO2 max and recovery time and predicts your race times for several distances when used with heart rate monitor. Activity Tracking: Forerunner 230 doubles as a watch and activity tracker. Count steps, calories and distance throughout the day. The move bar with vibration alert motivates you to move when you?ve been sitting too long. Graphical Interface: An easy-to-read color graph shows your heart rate zone at a quick glance. Connect IQ: Download watch faces, widgets, apps and data fields. Garmin Connect Mobile App: See a complete picture of your activities. Connected devices allow for instant uploads to the Garmin Connect Mobile app, so you can review and share even before you return to civilization.